An allergy is the over-reaction of a person’s immune system in response to something that would normally be ignored. Substances which can cause an allergic reaction are known as allergens, and are normally harmless to most people. However, to a person who is allergic to an allergen it may trigger a reaction, resulting in a range of symptoms from mild to life-threatening, with the symptoms dependent on the allergen. Hay fever – common symptoms include sneezing, a running nose and itchy eyes. It is caused by pollen released from plants. Due to the seasonal cycles of pollen release, hay fever is most common in the spring and summer months. Asthma – symptoms include wheezing, breathlessness, coughing and a feeling of chest tightness. In allergic asthma these symptoms can be triggered by allergens that cause inflammation in a person’s airway. How does an allergy work? This occurs when a person is first exposed to the allergen. A type of white blood cells, known as B cells, identify the allergen as a threat (Panel A) and produce a molecule known as an antibody in response (Panel B). These antibodies are specifically designed to recognise the allergen. They stick to the surface of immune cells called mast cells, where they stay in case more of the allergen appears in the future. When the allergen binds to the antibodies on the mast cells (Panel A) a signal is sent causing the mast cells to immediately release their chemicals contents (Panel B). One of the chemicals is called histamine. This causes a cascade of responses including inflammation that leads to the symptoms of an allergic reaction. Hay fever, also known as allergic rhinitis, occurs when a person is exposed to pollen. Once pollen enters the body it triggers the release of chemicals from mast cells including histamine. The resulting inflammation makes blood vessels in the surrounding area more ‘leaky’ leading to a runny nose, for example. Other effects of these chemicals includes the irritation of the nose, throat and eyes (if the allergen makes contact at this point), giving an itching sensation. On top of these immediate symptoms, some people experience delayed reactions such as a sore throat, stuffy nose and coughing. These tend to be less severe and are the result of an on-going inflammatory response. Most of these symptoms do not persist over an extended period of time, and are treatable with medicines that stop the symptoms from developing. A common type of medication, known as anti-histamines, are used to stop the symptomatic effects that the mast cell chemical histamine is causing in the allergic reaction. Not all asthma is caused by an allergic reaction. 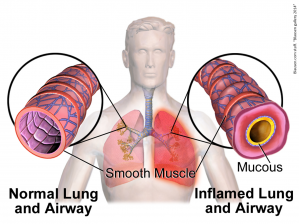 Whilst the symptoms of both allergic and non-allergic asthma are normally characterised by airway obstruction and inflammation, the causes are different. In an allergic asthma ‘attack’ the inhalation of the allergen, most commonly dust mites, causes an allergic response in the lower portions of the airway leading to the narrowing of the airway and congestion with fluids and thick mucus. This leads to the air in the bottom of the lungs being trapped making breathing extremely difficult, producing the symptoms of wheezing and chest tightness. The severity of the symptoms of allergic asthma varies from mild and self-resolving to persistent and progressive. In certain cases the symptoms can develop to be so severe that immediate medical attention is required. Asthma has no cure and current treatments involve avoiding allergens and the use of medications, steroid inhalers, that focus on relieving the symptoms and preventing future attacks. Currently there are no cures for allergies, and so one of the most effective ways to overcome an allergy is to avoid the allergen. When avoidance may be difficult, there are a number of treatment options that target the symptoms and mechanisms of the allergy such as taking anti-histamine medication. For some allergies it is possible to treat the cause of the allergy through an immunotherapy technique that attempts to ‘desensitise’ the body to the allergen in an effort to make the allergic reaction less severe. This remains one of the biggest unanswered questions of the allergy field. Despite the fact that little is still known about the general underlying reasons for allergy development, there is a strong body of research into understanding the causes of each specific type of allergy. The picture so far shows us that allergies are the result of a combination of different factors that include a person’s genetics, lifestyle choices and their surrounding environment. These components will then individually or collectively impact on a person’s likelihood to develop a certain allergy.